It is 25 years since loco-hauled services between Liverpool and Newcastle went over to Class 158 operation. David Russell looks back at the last few years of diesel haulage on the trans-Pennine route. 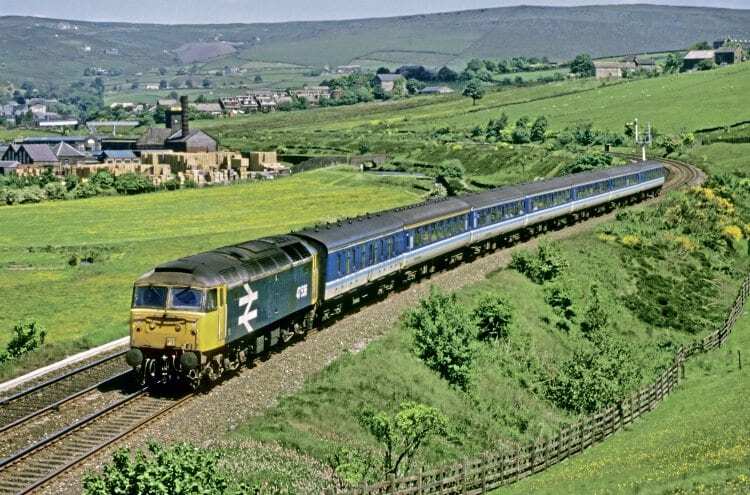 THE ‘Sprinterisation’ of rail services in the latter half of the 1980s and early 1990s saw the end of Provincial Services’ loco-hauled trains on many routes all over the country – but not least across the Pennines from Liverpool to York and beyond. From the outset of dieselisation in the early 1960s, it was possible to sample diesel haulage on trans-Pennine services between Liverpool and Newcastle. Single Class 40s, or English Electric Type 4s as they were then known, replaced pairs of former LMS steam locos on the Liverpool-Leeds leg and A3 power north of there. These would run via Harrogate and Ripon rather than York until the closure of the line from Harrogate to Northallerton in 1967. By the late 1970s, Class 47s were the most common form of motive power on the route, although other types would appear quite frequently. The ‘Deltics’, ousted from many of their duties on the East Coast Main Line by HSTs, started to appear on occasions from 1979 and other types, such as Classes 31, 40 and 45, would sometimes substitute. As well as the main services between Newcastle/York and Liverpool, there were other seasonal trains that ran over the Pennines via Huddersfield and Stalybridge and employed other types of traction. For example, in 1981 the 1M71/08.55 York-Llandudno and 1E86/09.00 Llandudno-York were both booked for Class 40 ‘Whistler’ haulage, the North Wales-bound train also having a portion from Sheffield that was added at Huddersfield, giving the opportunity for haulage behind the Class 08 station pilot. The introduction of a new timetable in May 1982 brought with it a major change to the trans-Pennine timetable, with the extension of the majority of Liverpool-York services through to Scarborough. This provided a departure from Liverpool every hour, with the destination alternating between Newcastle and Scarborough. The main motive power continued to be Class 47s, although this was soon to change, as from October that year a number of HST workings were introduced on to the Midland Main Line. This resulted in many of the Class 45/1s, which had previously been employed on trains out of St Pancras, becoming surplus and so they took up new duties working alongside ‘47s’ on the trans-Pennine route, although they continued to be maintained at Toton. 1983 saw further timetable changes, with a number of services running to North Wales rather than Liverpool and, as a result, ‘Peaks’ became a familiar sight on trains destined for Llandudno, Bangor or Holyhead. Inevitably, this resulted in the number of Class 40-hauled services along the North Wales Coast being reduced as the fleet started to be run down, although ‘40s’ would continue to stand in on trans-Pennine services. On one memorable day, July 20, 1984, no fewer than six examples (Nos. 40012/013/035/044/058/155) put in appearances – although one of these, No. 40035, failed to do more than a Liverpool-Huddersfield run. This was the final year of appearances by Class 40s as, with the exception of pioneer No. D200, the remaining examples were withdrawn in early 1985. October 12 – 45101/113/123/ 127/130/140-142, 47423/427/432/ 438/471/563/702. October 19 – 45108/114/117/127/135/137/143/145/148/149, 47189/474/497/503/522/546. October 26 – 45102/108/127/130/137/140/143/144/150, 47436/438/469/483/545. Of these, the most unusual appearance was that of No. 47702 Saint Cuthbert, which worked the 1E94/08.05 Liverpool-Newcastle on the first Saturday. This was a one-way working to return the loco to Scotland, and its return diagram – the 1M76/14.20 Newcastle to Liverpool –was handled by No. 45130. Other ‘foreign’ Class 47s used were Kingmoor’s Nos. 47474/503/563 and Inverness-based No. 47546 Aviemore Centre, and a steam-heat only example also put in an appearance (No. 47189). As can be seen, the Class 45s also swapped regularly, with just one member of the class appearing on all three days. The ‘Peaks’ had booked diagrams on the trans-Pennine route until May 1987, when another revamp of the timetable took place. Following the introduction of a couple of diagrams two months previously, Class 150/2s running as four-car sets took over all the workings between Scarborough and Liverpool/North Wales. Despite them being new trains, few could have considered the units with their 3+2 cramped seating as being suitable for such duties and, thankfully, they were replaced by Class 156 units within a couple of years. The last loco-hauled working out of Scarborough ran on May 10, 1987, when the 1M80/17.45 Scarborough-Liverpool was handled by No. 45150, which had arrived earlier with the 2P08/15.57 York-Scarborough. Although this was also the last day of booked Class 45 workings, this machine and No. 45108 both put in appearances during the following week. (Nos. 47401-420) became the usual motive power on the route, along with other examples from the depot. Following the sectorisation of British Rail in the mid-1980s, vehicles began to emerge in Provincial Services livery with ‘Trans-Pennine’ branding during 1986. Before the appearance of coaches in this colour scheme, a small number of vehicles had been outshopped from York Carriage Works in blue/grey with ‘Trans-Pennine’ rather than ‘Inter-City’ branding. For many years, services on the route were formed of eight coaches, comprising a BG (Full Brake), a single FK (Corridor First) and six Standard Class coaches. The seated vehicles were generally Mk.2 pressure ventilated vehicles, although some rakes also included a declassified Mk.1 FO (First Open), numbered in the No. 36xx series. Following the reduction in loco-hauled operations, the latter were dispensed with in 1987, and a number reverted back to FO status for use on charter trains following refurbishment – a duty that they still fulfil to this day within the Riviera Trains and West Coast Railways fleets. TSO – 5147/60/92, 5283/91/98, 5301/11/16/21/23/29/40/43/47/51/65/79/87/91/96, 5406/09/14/25/31/32/63/79, 5520, 5614. BG – 92044/58/89/92, 92137, 92204/48. 1987 also saw the closure of York Clifton carriage depot, which had only been constructed a few years earlier, resulting in Heaton taking charge of the maintenance of the coaching stock fleet, including the vehicles which had previously been based at Longsight. In May 1988, Gateshead lost its allocation of main line locos as part of a run-down in preparation for closure, and Crewe Diesel depot took over responsibility for supplying traction for trans-Pennine services. Consequently, the ‘Generator’ Class 47s were replaced by Crewe-based examples, and a number of nameplates appropriate to the area were transferred to the new fleet. No. 47443 became North Eastern (previously carried by No. 47401), the Gateshead plates were moved from No. 47402 to No. 47448, and No. 47407 surrendered its Aycliffe name to No. 47452. As part of the shift in responsibility, Nos. 47421-425 were reallocated from Gateshead to Crewe. The aforementioned No. 47452 was only used on the route for a short period, as it was transferred to Stratford later in the year. The beginning of 1989 saw the emergence of No. 47475 in Provincial Services colours, matching the coaching stock that had first appeared in this livery some 18 months previously. No other locos gained these colours, and it saw use on trans-Pennine duties in its unique livery until October 1990. By this time, the smart uniform appearance of the coaching stock had been somewhat lost, as changes had been made to the train consists. The rakes had already been reduced from eight to seven vehicles by removing the FK when the services became Standard Class only, but a further change in 1990 saw a reduction to six coaches take place. This was done by replacing the BG and a TSO with a BSO, and Nos. 9412/21/23/40/48/61, most of which carried blue/grey colours, were transferred in for the final few months of operation. Several other blue/grey coaches that had been displaced from other routes following ‘Sprinterisation’, were also drafted in during the last few months as other coaches became due overhaul and were withdrawn. The May 1989 timetable change brought with it an alteration in the routing of trans-Pennine services on the western half of the route, with services being diverted to call at Manchester Piccadilly and Oxford Road instead of Manchester Victoria, which by this time was in a somewhat run-down state. The change provided a much better interchange for passengers who had travelled across the Pennines and were heading south, although one consequence was the demise of the frequent shuttle between Stalybridge and Stockport. This was relegated to a ‘Parliamentary’ service, which still runs just once a week today. The trains were also re-routed between Manchester and Liverpool. Instead of running via Newton-le-Willows, Earlestown and St Helens Junction, they served Birchwood and Warrington Central. More than 25 years later, Warrington is set to lose its trans-Pennine services as part of the new franchise from April 2016, with the Chat Moss line via Newton-le-Willows once again becoming the route of choice. 1989 also saw the arrival of the first of a number of Class 47s from Scotland, which had been declared surplus there after the introduction of Class 156 and 158 units. Nos. 47477 and 47597 were the first to be transferred south in May 1989. Further examples arrived from Scotland during 1990, as others that had been used on trans-Pennine duties were either withdrawn or transferred away. Locos that migrated south from either Eastfield or Inverness to the Provincial Services pool at Crewe were Nos. 47460/461, 47492 The Enterprising Scot, 47541 The Queen Mother, 47635 Jimmy Milne, 47640 University of Strathclyde and 47642 Strathisla. Crewe’s Provincial ‘47s’ also saw use on Leeds-Carlisle services until that went over to Class 156 operation in October 1990, as well as on some turns between Manchester and Barrow. No. 31970 turned a few heads when it worked from Liverpool to York and back, while August 25 saw No. 47340 make a return trip to Newcastle from Liverpool. The last day of loco-hauled operations occurred on January 20, 1991, somewhat later than planned owing to delays in the construction of the Class 158 fleet. The first of these new ‘Express’ units, which were for use in Scotland, had been due to enter traffic when the new timetable came into operation in May 1990. But it was four months later before the first example ran in revenue-earning service. The delays in their introduction meant that some of the units initially used on trans-Pennine services, Nos. 158734-746, were actually destined for ScotRail, and within a few months they had moved north to Scotland, having been replaced by later build examples. With the last day of operations being on a Sunday, this required – on paper – five rakes of stock and six locos (owing to the fact that locos dropped back on to a rake at Liverpool to avoid the need for a shunt release). Attempts had been made to secure one of the remaining ‘Generator’ Class 47s for use on the final southbound working, the 1M48/18.07 Newcastle-Liverpool. But these plans failed to come to fruition, and instead arrangements were made to use the appropriately named No. 47443 North Eastern on this train, which was strengthened by three extra coaches upon its arrival from Liverpool (the main rake set being used on the 1M06/08.45 Newcastle-Liverpool and 1E58/13.25 return). No. 31166. This meant the stock was not at Liverpool in time to undertake its booked return working, so a ‘scratch’ rake of just three coaches from Edge Hill was provided for this service. Class 158 DMUs took over the next day and, although the demise of loco-hauled trains from the trans-Pennine route caused much disappointment among enthusiasts, there has been a major improvement in services since then. The opening of the line to Manchester Airport and an increase in frequency of trains have both contributed to the huge increase in passenger numbers. The Class 158s were themselves ousted by three-car Class 185 ‘Desiros’ in 2006-2007 and, with the route from Leeds to Manchester now suffering from severe overcrowding, the Department for Transport may well regret having not authorised the construction of extra cars to make a number of units up to four vehicles when it had the opportunity to do so. Loco-hauled trains did return to the line briefly for a day in July 2014, when Nos. 47841 and 47853 Rail Express worked two return trips from Liverpool to Scarborough and back, providing extra capacity when the ‘Tour de France’ visited Yorkshire. Will another loco-hauled working ever run again? Only time will tell, but it is a possibility!